Adr1ft is described as a "first-person experience (FPX)," and make of that modern distinction what you will, there's no question that it looks very nice so far. You play—sorry, experience—it as an astronaut floating amongst the wreckage of a destroyed space station, with a leaky suit and no memory of how you got there. Your only hope for survival is to explore what's left, salvage what you can, and try to find a way home. The trailer playing above was originally intended for E3 but leaked, according to a tweet by developer Three One Zero. "We made it with Blur. 100% game assets. Please enjoy," the studio wrote. It also provided a link to the trailer on YouTube, presumably trying to make the best of a bad situation, but the video has now been marked as private. Fortunately for we nosy types, several sites, including Only Single Player, were able to make copies on their own channels before it went dark. Adr1ft will support the Oculus Rift, as it clearly should, and possibly Valve's Vive headset as well, as the studio tweeted earlier this week that it has received a Vive developer's kit. But even without the magic of VR support, it made a powerful impression in our brief hands-on in March. 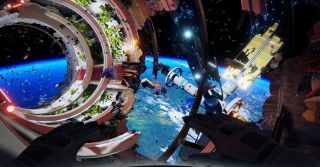 "Playing the 10-minute demo of Adr1ft is something I’d class as a genuinely memorable and worthwhile experience," Sam wrote. "I find myself unable to remember so much of what I saw at the show, but damn, I won’t forget the first time I saw an enormous pink-leafed tree surrounded by glass looking out onto space in Ad1ft." Adr1ft is currently slated to come out sometime in September. Find out more at Adr1ft.com.